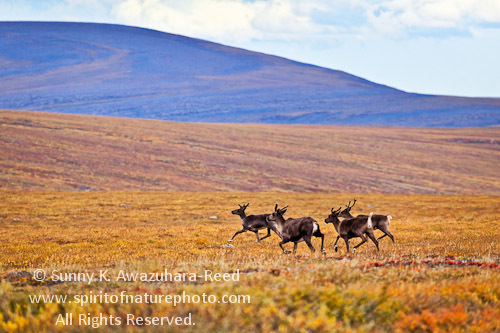 After progressing up to Deadhorse (Prudhoe Bay), it’s time to explore in the Gate of Arctic National Park & Preserve on foot. The 3-day backpacking trip began with crossing icy cold Dietrich River. Soon after I put dry shoes back on, a long steep ascent weaved before us... 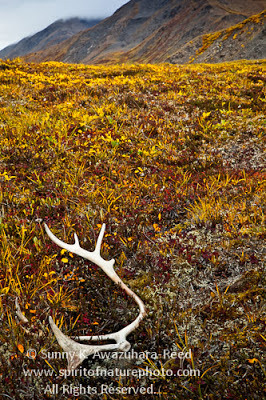 The tundra-covered hillside angled almost straight up to the ridge... In this undeveloped National Park, there aren't any systematic trails. Hikers have to find own way and navigate with a map and compass. After only a few hours of climbing, the valley with the Dalton Hwy and Dietrich River sprawled far below me! 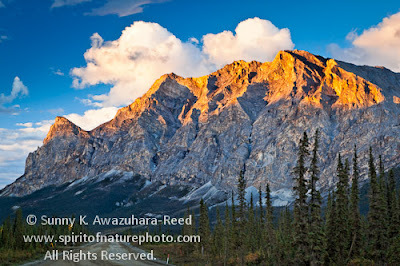 The entire valley and the mountains above were lighting up with warm afternoon sun. 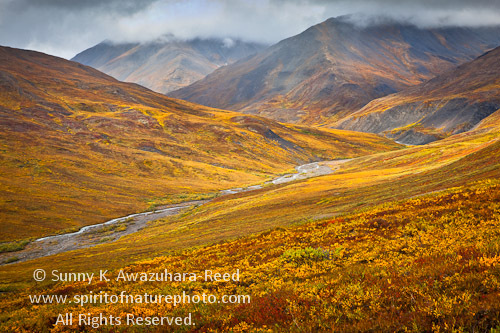 The wide unfolding ridge was almost flat, covered with tundra and numerous tiny streams. 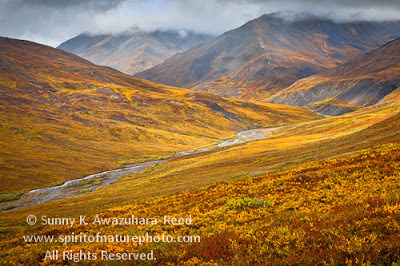 I found a perfect Zen garden among the autumn tundra. 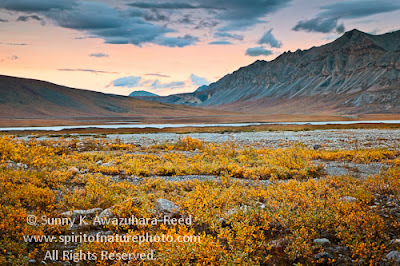 The first night’s camp was on the ridge, overlooking the Kuyuktuvuk Creek Valley. The clouds rolled in and it rained all night. Fortunately, the rain stopped the next morning. Slowly climbing down to the creek, into the valley with colorful fall colors, I was amazed this pristine dramatic scenery where only a few people had ever visited. 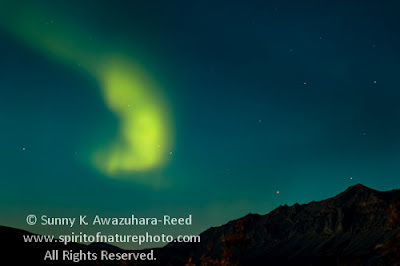 I spotted a fresh bear dropping, the skull of Dall Sheep, the skin of Caribou, but never saw any large wildlife except an oversized porcupine. 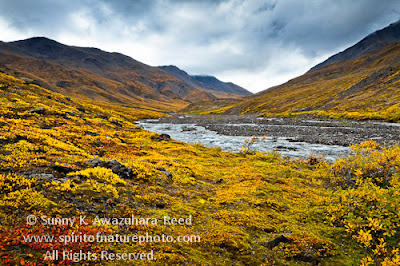 Walking on the ancient glacial moraine, gully, crossing the swift Kuyuktuvuk Creek, and hiking up to the tundra hillside for the entire day. As I hiked along Kuyuktuvuk Creek to upstream, the landscape was changing drastically; less vegetation with rocky terrain. 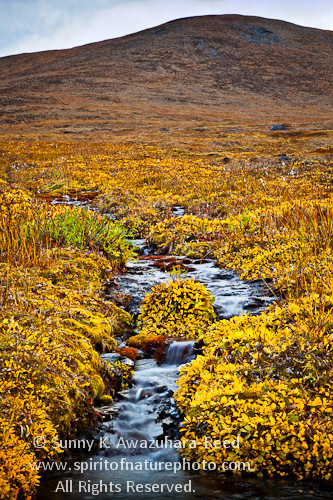 Snow dusted mountains were towering above, and the rushing creeks became narrow and shallow streams. When I reached Oolah Lake, the air was different, much colder than the ridge I awoke on in the morning! After breaking camp near Oolah Lake, I retraced our steps back along Kuyuktuvuk Creek. I climbed back to the steep hillside, walked across the wide boggy ridge, and descended straight down to Dietrich River for one full day. 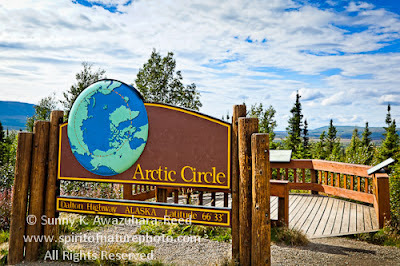 The whole area was truly magical, I was in the beautiful Arctic dream. "Far North" - north of the Arctic Circle – above the latitude 66°33′44″ North, the remote wilderness of Brooks Range to Arctic Ocean – an area I have found fascinating for over 10 years since my first summer in Alaska. This part of Alaska is the land of the midnight sun - sun stays above the horizon for 24 hours at the summer solstice, vegetation grows fast under the perpetual light, and wildlife - bears, caribou, moose, and wolves are always busy feeding and reproducing during the short summer. The only road across the remote Arctic is the 414 mile Dalton Highway from Fairbanks via Steese Hwy and Elliot Hwy, a total of 500 miles to Prudhoe Bay (Arctic Ocean), 850 miles from Anchorage! In mid August, while it was still late summer in Anchorage, my journey to Arctic began. 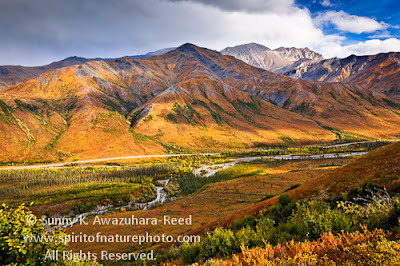 Passing through Fairbanks, 350 miles from Anchorage, the fall was already starting! The birch woods were turning to yellow. 84 miles from Fairbanks, the Dalton Hwy started with dirt road and a lot of construction. 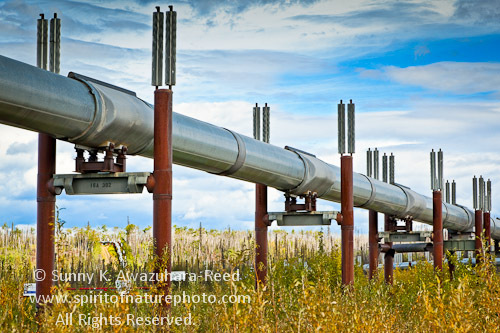 After crossing the Yukon River, the highway follows the pipeline to the north. The Birch woods changed to the land of permafrost with boreal forest. 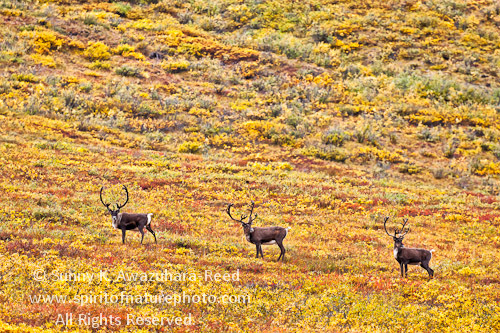 The open tundra was already a golden fall color when I entered the Arctic Circle. Countless rivers and lakes lay scattered across the open valley. 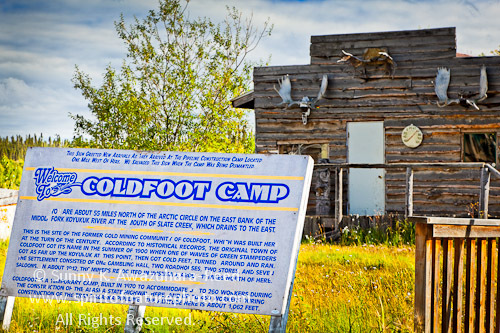 The historic gold rush town Coldfoot is now a big truck stop for huge trucks which heading to/from North Slope oilfield. 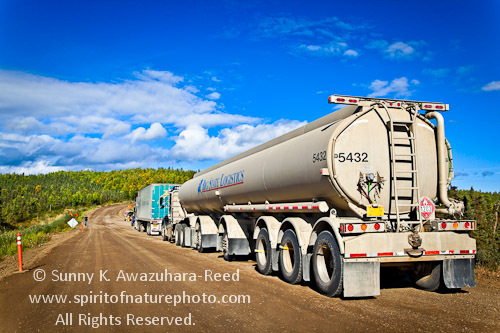 This is a last place for gas and supplies until Deadhorse, on the north end of Dalton Hwy. 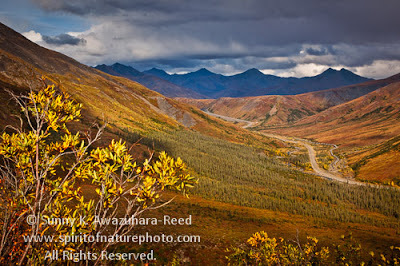 The highlight of the Dalton Highway is north of Coldfoot; the spectacular Brooks Mountains begin. 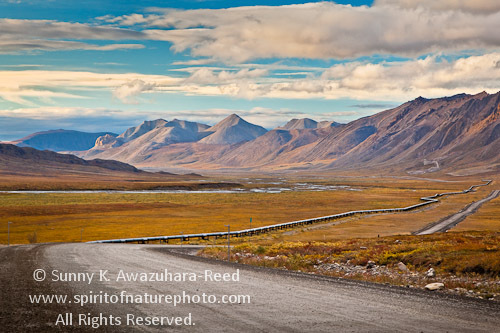 Gate of Arctic National Park & Preserve, Arctic National Wildlife Refuge, and some other protected lands are laid along the highway. The colors of the tundra was vibrantly painted in orange and red, glowing in the nearly everlasting autumn sun. 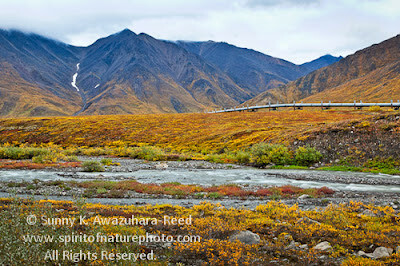 Crossing Atigun Pass, the rivers north of the pass flow into the Arctic Ocean, and the rivers in the south flow into the Pacific Ocean. 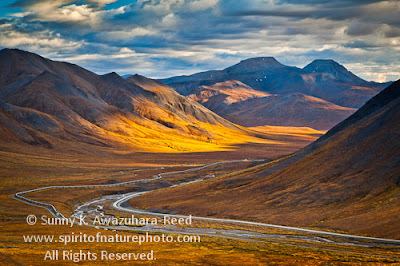 The dramatic scenery - rugged mountains and tundra valley continues on. 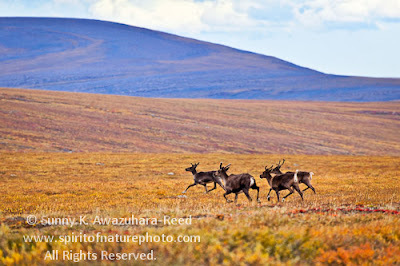 It was an emotional moment when I finally saw the edge of Arctic National Wildlife Refuge after signing so many petitions to protect this pristine remote land from oil development for the past years. When I first heard about this area and the issue, I was still young, maybe a teenager in Japan, but I was strongly moved and felt pain for the political issue. Finally I was there, seeing the evening light shine down upon the rugged mountains and the valleys from the Dalton Hwy... 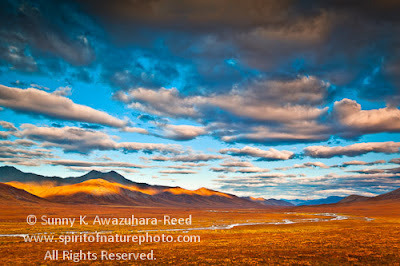 The landscape of the refuge is stunning. I hope this area will be permanently protected for future. 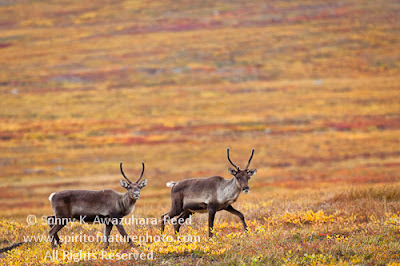 Caribou crossing the tundra on north of Brooks Range. The darkness of night lasts for at least a few hours... The northern lights start dancing the Arctic. 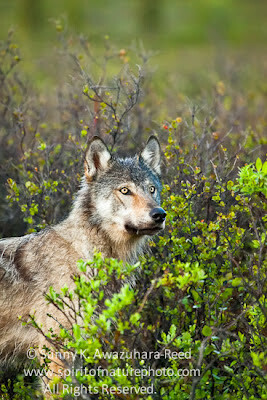 I know it's been an overdue update, my excuse is I've been taking many trips to Alaskan wilderness for photo projects. Summer in Alaska is short, I have to make the most out of it. I have mountains of photos to go through... Before editing hundreds of photos from each trip, I was already off to the next adventure. 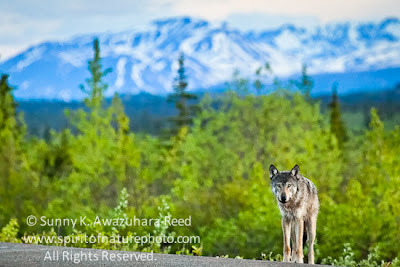 Well, I'd like to share my first Wolf images, taken just south of Denali. It was in mid June, after a long sunset at nearly midnight, finally dusk had come down in the interior of Alaska. I was heading north on George Park Highway to explore the isolated and lightly travelled Denali Highway. There was a dog-like animal crossing the highway in the twilight. 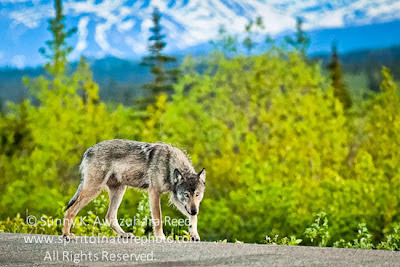 As I got closer I realized it was a wild Grey Wolf! 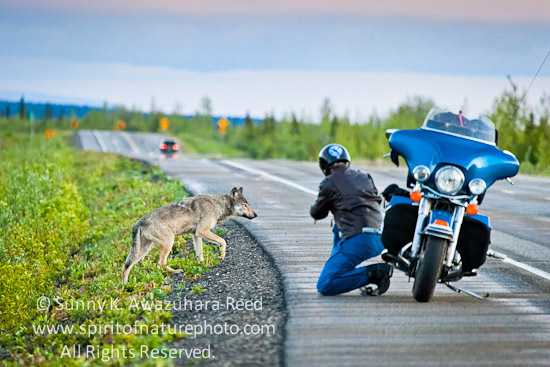 A motorcycler stopping to photograph the unforgettable sight. After a while, the wolf jumped back in the bush. 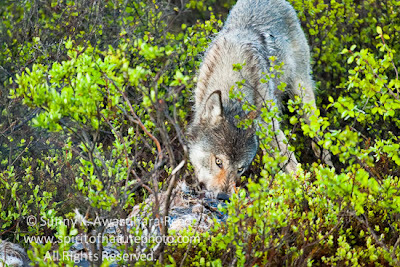 There he was scavenging a Moose carcass only a several yards away from the highway. I kept pressing the shutter button for his up close! 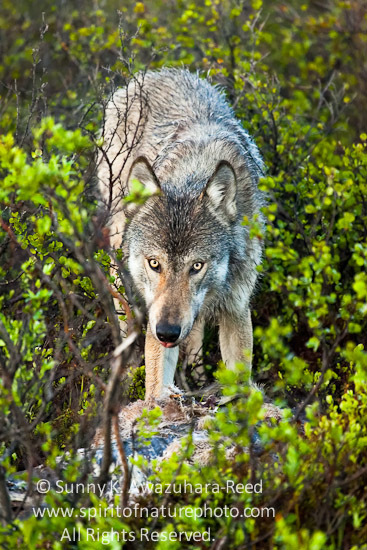 He occasionally would stare at me while he was intensely chewing the carcass, ready to defend his sustenance in a moment's notice. I could see the wild ferocity burning incandescently his yellow eyes. Finally, he dragged a piece of Moose, and disappeared into the wilderness. 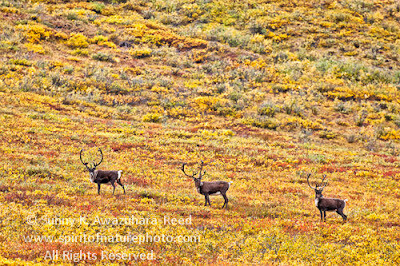 It was one of the most special moments that Alaska's natural elegance has brought me thus far.